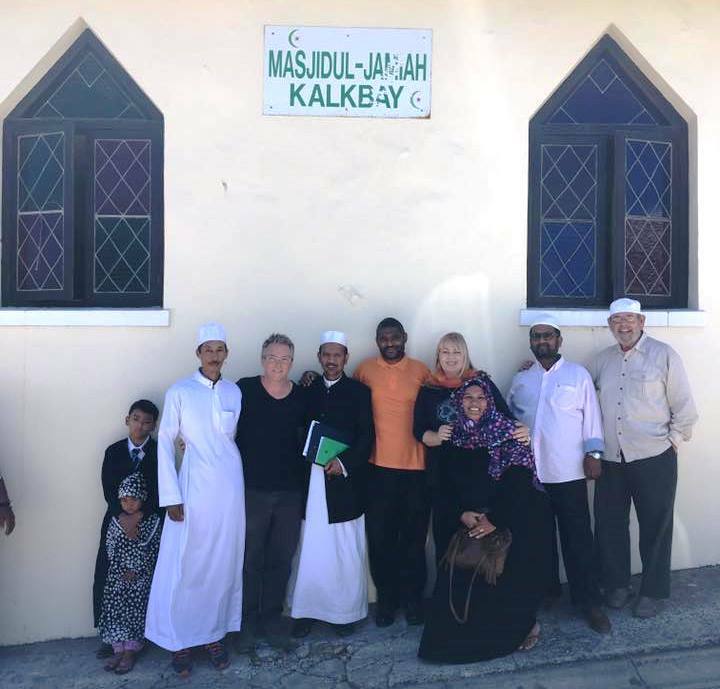 Cape Town Interfaith Initiative | CTII shows solidarity with desecrated Mosques. CTII shows solidarity with desecrated Mosques. CTII visit the Masjidul-Jamiah Kalk Bay. Imam Achmat Sity is in the middle (holding kutbah); on his left in orange is James Ellman, CTII director. Last week 2 mosques in the False Bay area, at Kalk Bay and Simon’s Town, were desecrated, spattered with pig’s blood and body parts as part of a presumed Islamophobic attack. “We in South Arica have been embracing Islam for 3 hundred years along all other faiths with peace and harmony … we respect each and every human being with honour and dignity. Never in the history were we as a peace loving community practising our diversity of faiths in Simons town and Kalkbay been confronted with this evil act of someone that’s sick in his mind. It would be appropriate for people of all faiths (and none) who share values of peace and tolerance to acknowledge the global climate and like Imam Sity, resist fear, intolerance and the scapegoating of all we deem “other”. This is the challenge of these events for all of us in Cape Town and on this planet. A Call to a Service of Prayer and Solidarity from the religious and civic leaders of Simons Town to meet at the Simon’s Town mosque, 9 Thomas Street on Friday 20 th January at 4.00 pm to express our support for Imaam Raban and our sisters and brothers of the Muslim community of Simon Town in the wake of the attack on their place of worship and peaceful presence. Leaders of the community are invited to bring short messages of support and encouragement.